I was looking at some old pictures I had taken near Olvera Street several years ago. 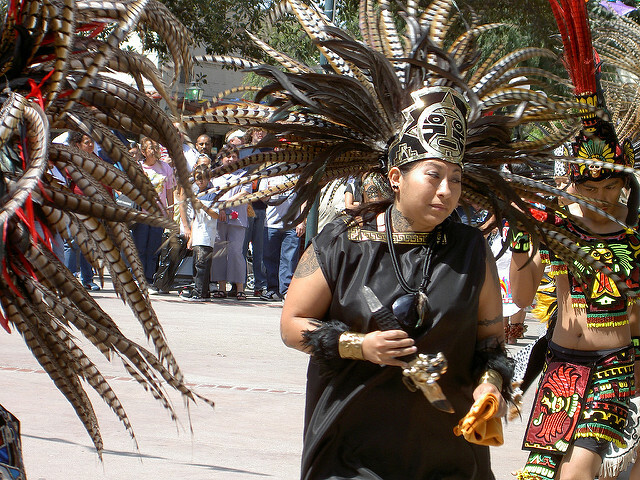 There was a Meso-American dance troupe dancing by what passes in L.A. for the city’s zocalo. This was the center of Los Angeles when it was founded in 1781. There are several 19th century museums, including the Chinese-American Museum and the old firehouse; there is an old Catholic church, Our Lady Queen of Angels; and, of course, there is Olvera Street with its restaurants and Mexican handicrafts. What I like about the Pueblo is its seeming lack of self-consciousness. There are some scheduled events, such as the annual blessing of the animals by the Catholic Archbishop of Los Angeles that takes place in April. But there is also a lot of spontaneity. Walk across Alameda Street from the Pueblo, and you find yourself at Union Station, L.A. art deco railroad station, which has since been turned into a rail and bus transit hub. That’s where I first arrived in Los Angeles on the El Capitan in December 1966. A block or two north, and you’re in Chinatown. Not far south is Little Tokyo, and a mile or two east begins the East Los Angeles barrio. I find myself in love with the city’s endless variety. This entry was posted in southern california and tagged ethnicity, los-angeles, pueblo-de-los-angeles. Bookmark the permalink.